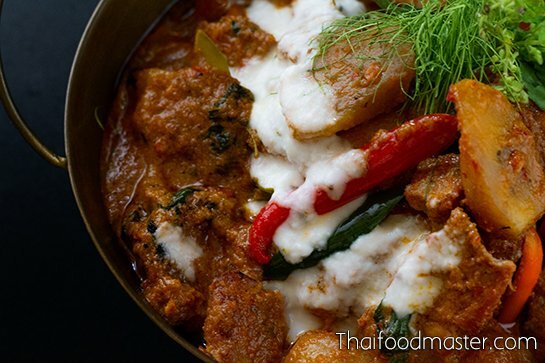 It is a thick, rich curry, cooked with freshly squeezed coconut cream, seasoned to a salty-sweet flavor and finished with kaffir lime leaves and holy basil leaves for freshness. We will grill the pork until it’s fully cooked and its outer layers nicely caramelized. 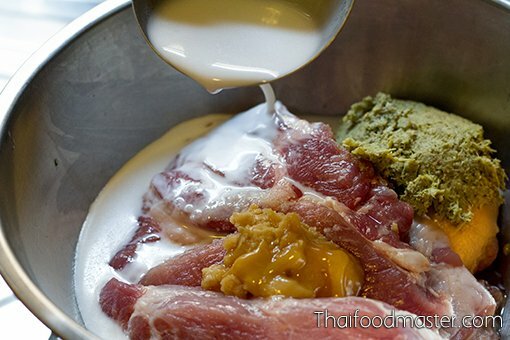 We introduce the curry’s ingredient flavors to the pork in the grilling stage – incorporating all the flavors into the meat, including the “Three Kings” of Thai cooking – coriander root, garlic and white peppercorns – along with coconut cream, fish sauce and palm sugar. 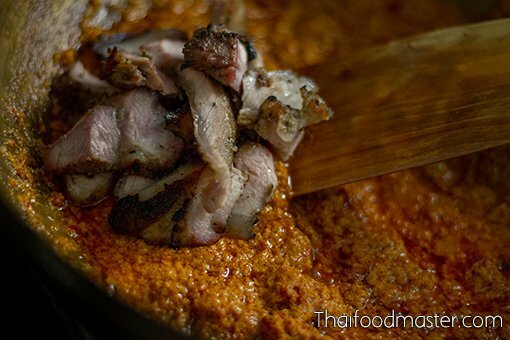 For even more intoxicating flavor, we will enhance the coconut essence in the dish by adding grated coconut over the hot charcoal while grilling the pork: This will intensify the pork with a sweet coconut smokiness that blends beautifully with the coconut base curry, resulting in a simple yet refined dish. 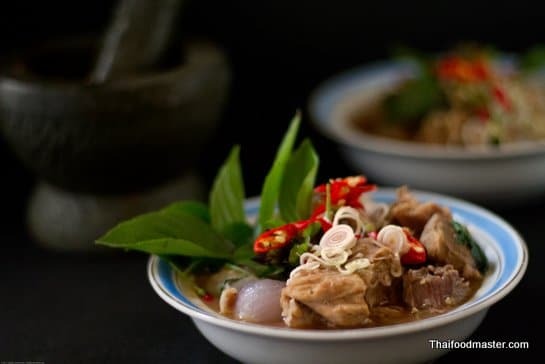 Thai cuisine is renowned for its crafted composition of tastes and textures: this dish elegantly demonstrates as well the ancient Siamese tradition of balancing the medicinal properties in each ingredient. 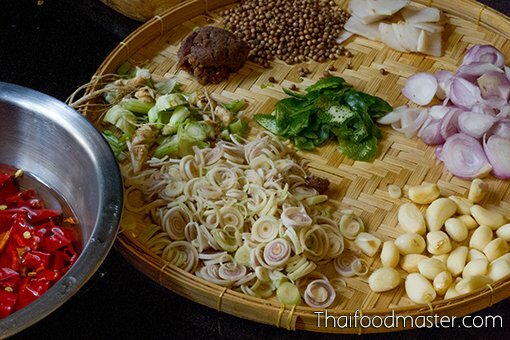 Thai traditional medicine, with influences from the Indian Ayurvedic tradition and holistic Chinese medicine, advocates living in harmony with nature as the key to longevity and a healthy life. Each ingredient possesses properties that address internal energies and that can be utilized to balance those internal energies. 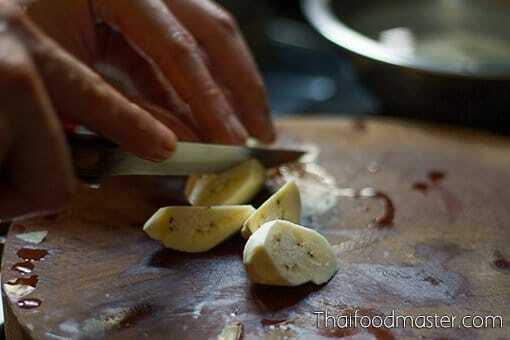 For instance, raw bananas are used to offset the heat of the chili-based curry. The ancient Chinese medicine book, “Ben Cao Gang Mu Shi Yi”, mentions that the banana is sweet in taste and cold in nature, and that the unripe banana fruit is a strong astringent that aids digestion and prevents gastric ulcers. 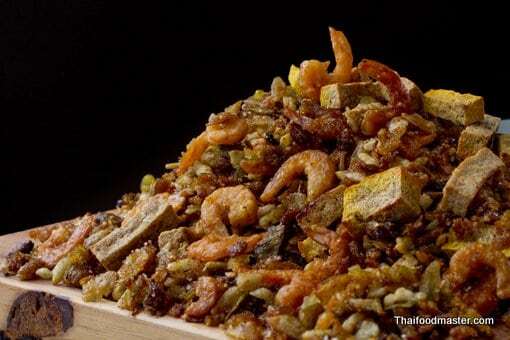 In the old days, Thai mothers fed to their babies a formula of cooked rice mixed with ground banana; this was believed to improve digestion. Modern medicine supports this idea and recognizes bananas as a remedy for various gastrointestinal conditions, from diarrhea to peptic ulcers, due to their high levels of tannins, sitoindosides and leucocyanidins. As well, the banana tree accompanies Thai people from birth to the afterlife. To invite protective spirits, newborns are gifted with decorative objects made out of banana leaves. The banana tree continues to provide throughout life, with nearly endless uses for banana leaves, trunks and fruit, finally ending with the female spirit ghost, Maae Praai Taanee (แม่พรายตานี), who resides in banana trees and in Thai beliefs. 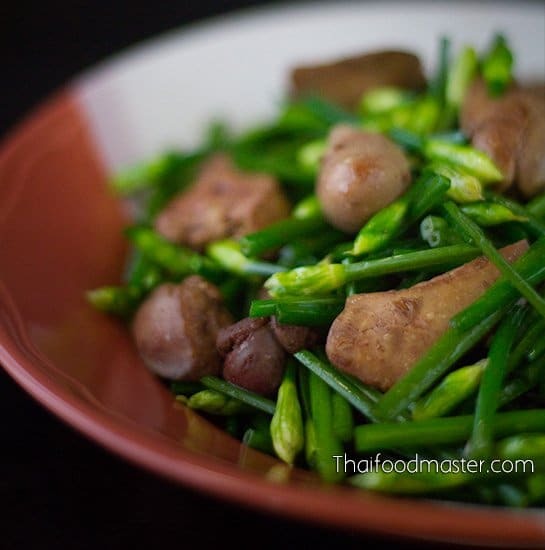 This recipe is adapted from “Maae Khruaa Huaa Bpaa” (แม่ครัวหัวป่าก์), a cookbook published in 1971 as a memorial for Jao Jaawm Phit (เจ้าจอมพิศว์); this recipe can also be found in other old cookbooks. 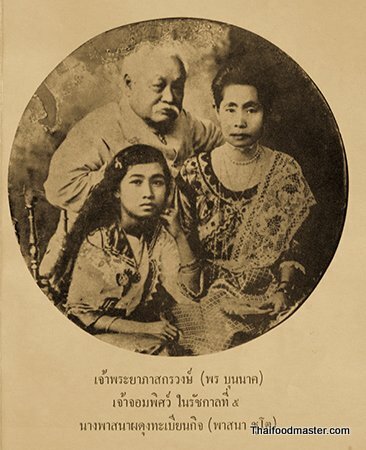 Jao Jaawm Phit was the daughter of Jao Phrayaa Passakornrawong (Phaawn), a nobleman and a prominent political figure in the 19th century, as well as a descendant of the powerful aristocratic Siamese family of Persian origin – the Bunnag family. 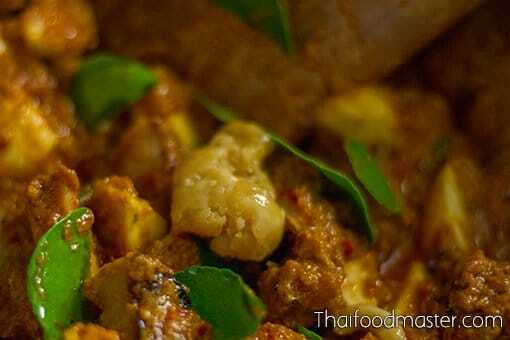 Jao Jaawm Phit’s mother, Thanpuying (Lady) Plean Passakornrawong, was a pioneer of noble Thai cuisine. 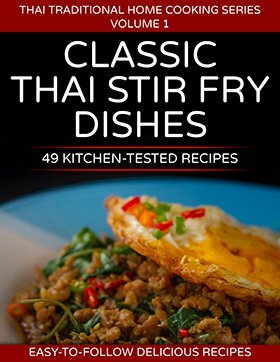 Lady Thanpuying is known for her culinary writing. 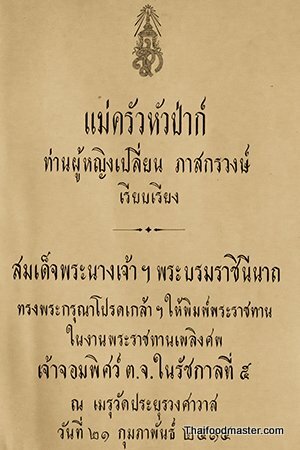 Considered to be the first comprehensive Thai cookbook, Maae Khruaa Huaa Bpaa (แม่ครัวหัวป่าก์), her book consists of five volumes: its first edition, from 1908, is quite rare and sought after by connoisseurs of Thai food. 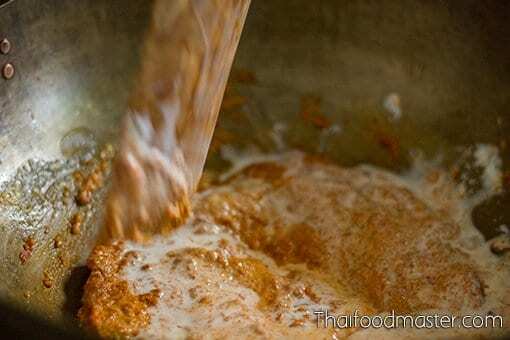 Make your own curry paste using fresh ingredients and a stone pestle and mortar. 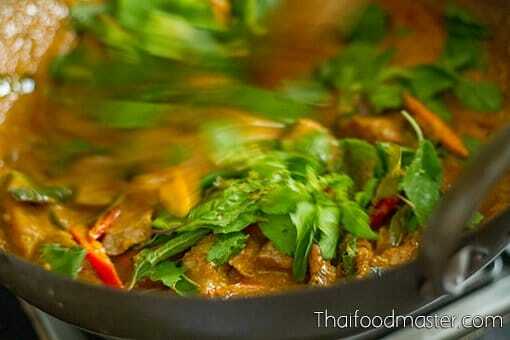 You will never get the full aroma or the same complexity of flavors from premade curry mixtures. 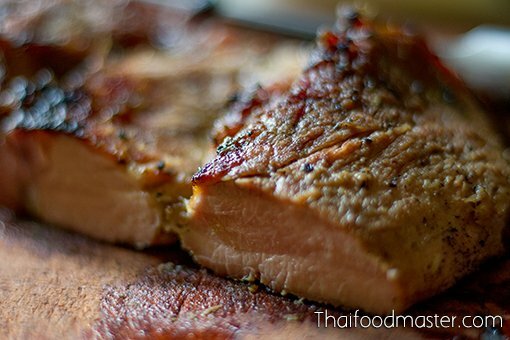 Use pork neck or pork belly as the meat cut of choice. 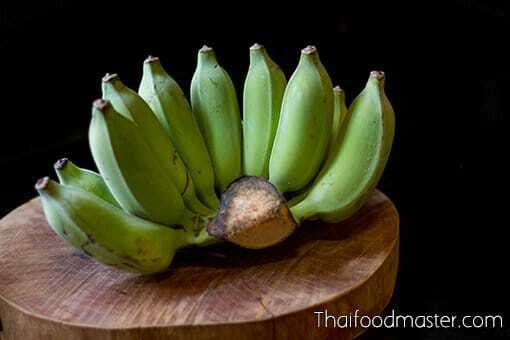 Peel the green bananas and cut them into uniformly sized pieces. 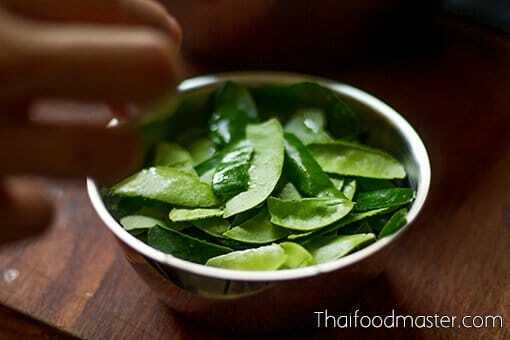 Soak the pieces in water mixed with lime and salt to prevent oxidization and to remove some of their unripe stickiness. 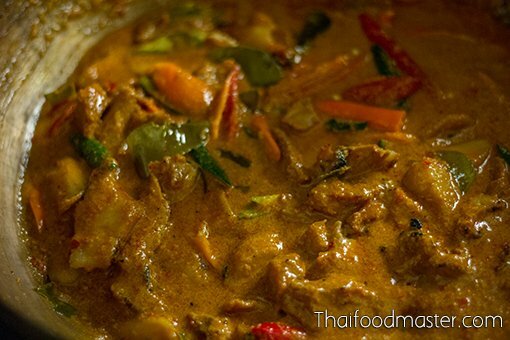 Usually we use Thai sweet basil, but have chosen to use Holy Basil in this recipe. If you can find it, the red variety is more aromatic. Balance the taste for spicy and salty with a touch of sweetness. 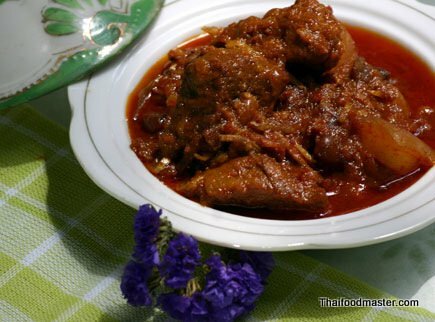 This curry pairs well with deep-fried fish, Thai-style omelet or pomelo salad. 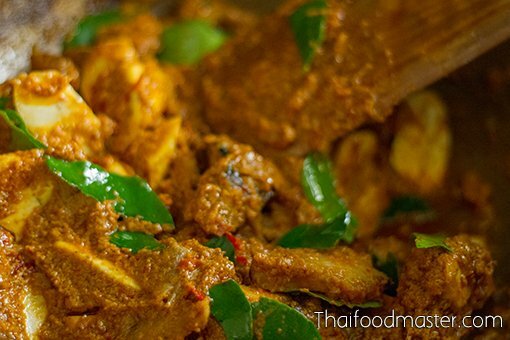 A rich Thai red curry, cooked with freshly squeezed coconut cream, with grilled & smoked pork neck and unripe green bananas. 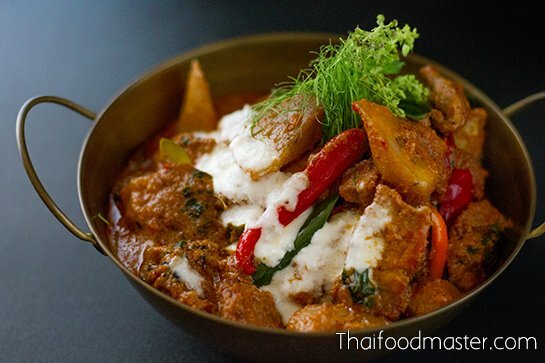 It is seasoned to a salty-sweet flavor and finished with kaffir lime leaves and holy basil leaves for freshness. 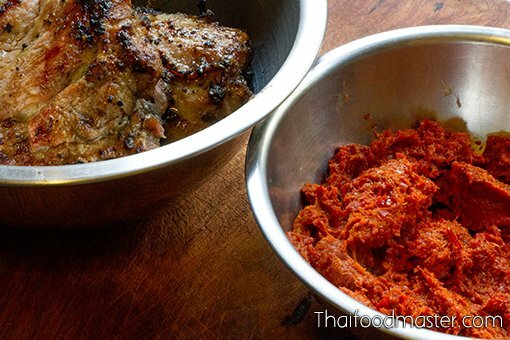 Marinate the pork meat for at least two hours, in a paste of coriander root, garlic and white peppercorns, palm sugar, fish sauce and coconut milk. Charcoal grill the pork over low heat, and toss a handful of grated coconut over the hot charcoal to smoke the meat. Slice the pork into thin, bite-sized pieces. De-seed the dry long chilies and soak them in hot water until soft. 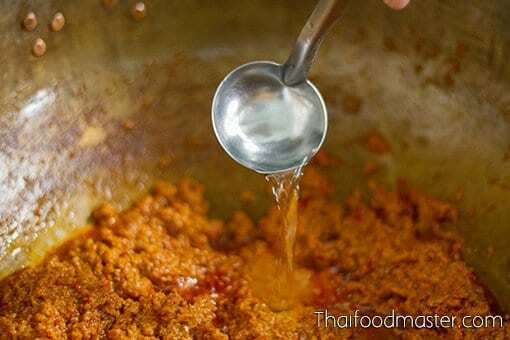 This is a visual overview for the ratio of ingredients in the curry paste. 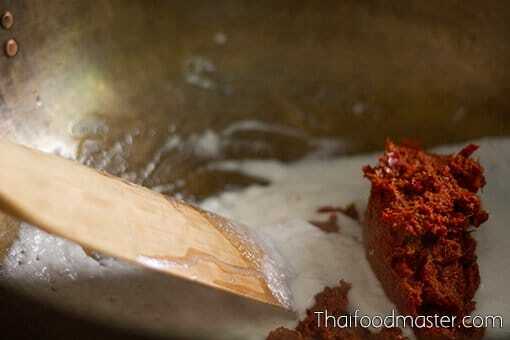 Pound the curry paste; start with the chilies and gradually add the other ingredients, from the driest to the wet. Select unripe green bananas - any kind will do. 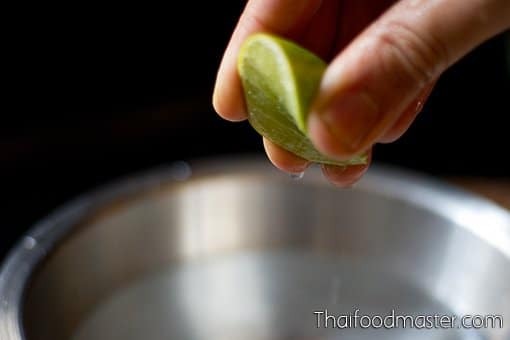 Prepare a mixing bowl with salt water and add a squeeze of lime. Peel the bananas, and cut them into even slices. Place them in the salt water and set aside. Pick the basil leaves and set aside. Tear kaffir lime leaves and set aside. 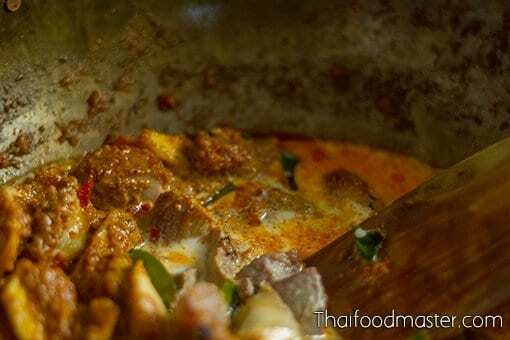 In a cooking pot, heat coconut cream until it breaks (cracked), and then add the red curry paste. The curry base is ready when the coconut is releasing clear oil. Be careful not to burn the paste. 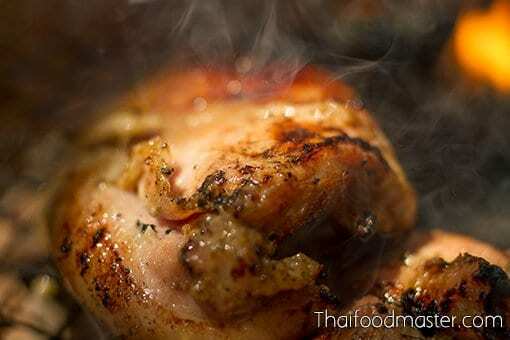 Tip: Add a tablespoon of water to help separate the oils. 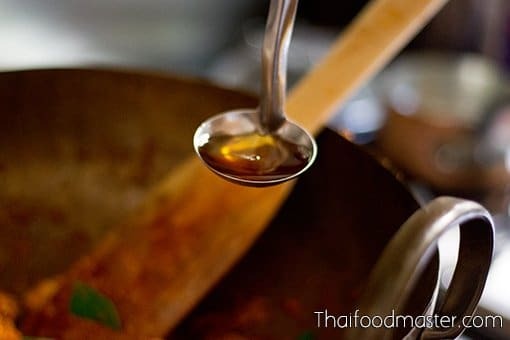 You will immediately see a deep red oil floating; this will enhance the appearance of the dish. 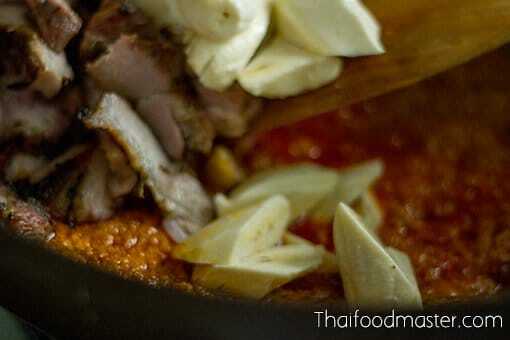 Add the grilled pork slices. Add the unripe green bananas. Cook while stirring until the bananas soften. 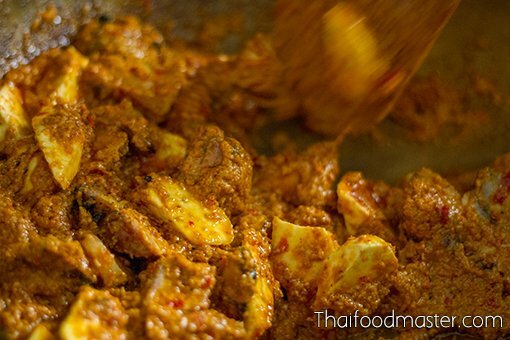 Keep cooking until you are pleased with the consistency of the bananas and curry; adjust flavors as needed. 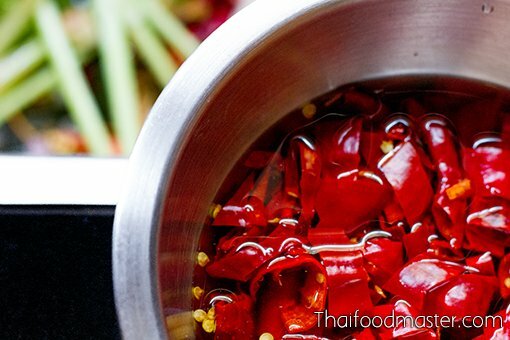 Add hot chilies of three colors – red, green and yellow. 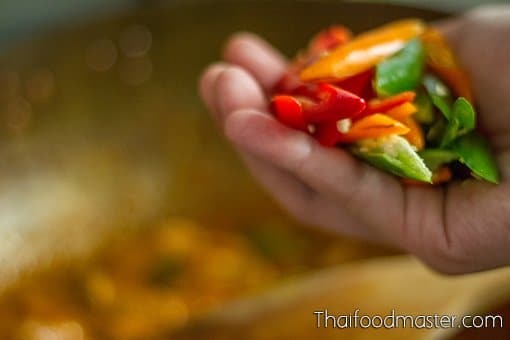 Cook for couple of minutes until the chilies release their flavors. 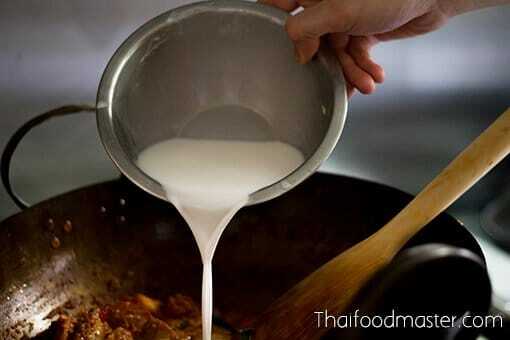 Over low heat in a separate bowl, thicken some coconut cream with a pinch of salt, for topping. 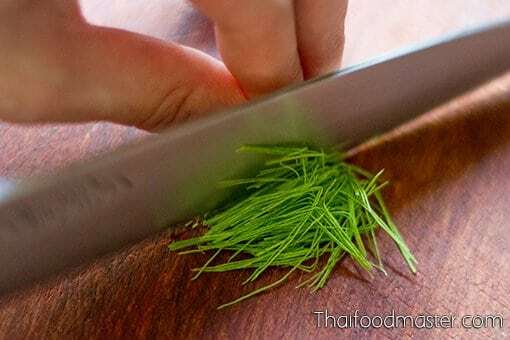 Add very thinly julienned kaffir lime leaves for decoration. 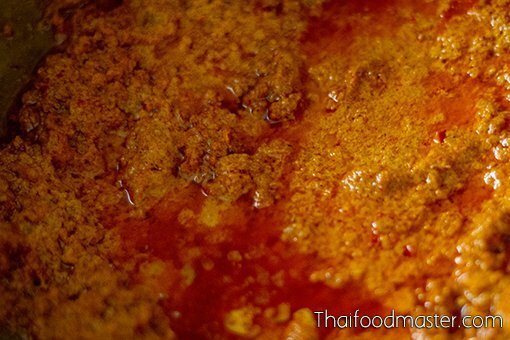 I’m wondering why the curry paste has not shrimp paste in it? 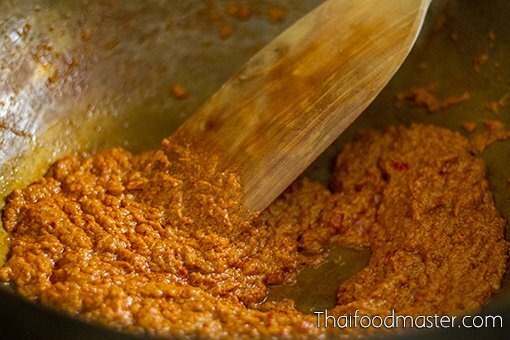 fermented shrimp paste is normally used in red curry pastes (both geang phet and geang kua). 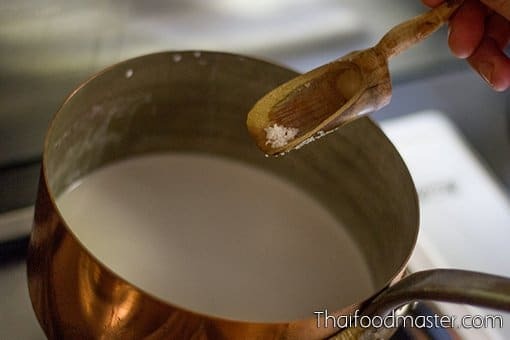 however the recipe presented in this article is from the cookbook “Maae Khruaa Huaa Bpaa” (แม่ครัวหัวป่าก์), published in 1971 as a memorial for Jao Jaawm Phit (เจ้าจอมพิศว์) which does not call for fermented shrimp paste. Adding it would not be a mistake of course.